This review first appeared in the May 6, 1988 issue of The San Diego Evening Tribune. This blues/soul/roots album was recorded more than a decade ago, and is being released nationally for the first time. 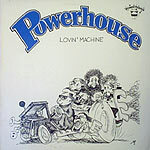 A now-defunct East Coast combo, Powerhouse was led by vocalist George Leh, whose reedy tenor is somewhat reminiscent of B.B. King's. "Lovin' Machine" is a practical encyclopedia of how to play R&B, blues and early rock. Ray Charles' "Hard Times" may be the best example. Leh's impassioned vocals will rattle the china, and Ben Kay's piano intro would move Brother Ray himself. "Sad Hours," the only instrumental, lets guitarist Tom Principato and harpist Pierre Beauregard stretch out. And tenor saxophonist Dave Birkin wails a haunting sound throughout the record. Powerhouse's covers of "Flip, Flop and Fly," "Sweet Little Woman," "Stompin' at the Savoy" and Leiber-Stoller's "Saved" make this one of the best regional albums since George Thorogood wandered out of New Jersey 15 years ago.